New Horizons continues on course and in good health. In a couple of weeks, I'll update you on a wide range of mission news items. But I want to devote this "PI Perspective" to a different topic: Pluto's planethood. Last month, the International Astronomical Union (IAU) held its first general assembly since 2003. The meeting was in Prague, and about a quarter of the IAU's 10,000 members attended. At the end of the meeting, on Aug. 24, a session was held to vote on proposals to define the word "planet." Just over 400 astronomers attended that session and voted. Although I am an IAU member, I could not attend the meeting because my oldest daughter was starting her freshman year of college during the week of Aug. 20 back in the states. The now widely known result of the final IAU session was a planet definition that has created a public and professional uproar unlike anything I can ever remember resulting from IAU resolutions (after all, they are usually about dry subjects like how to designate comets or the utility of leap seconds). 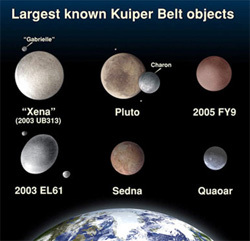 The IAU's planet definition ejects Pluto and the other dwarf planets of the solar system from the list of worlds that the IAU considers to be planets - this despite the IAU confusingly adopting the term "dwarf planet" for these worlds. Linguists, scientists and the lay public have barraged the media and the IAU with complaints about numerous aspects of the IAU planet definition. I have been involved in the debate. My conclusion is that the IAU definition is not only unworkable and unteachable, but so scientifically flawed and internally contradictory that it cannot be strongly defended against claims of scientific sloppiness, "ir-rigor," and cogent classification. The New Horizons project, like a growing number of the public, and many hundreds if not thousands of professional research astronomers and planetary scientists, will not recognize the IAU's planet definition resolution of Aug. 24, 2006. As the leader of New Horizons, I believe this is the right course for us to take, for a number of reasons. One is that the IAU definition is too controversial. Another is that it is losing, rather than gaining, support, and is likely to be largely irrelevant in the long term. A third is, despite the fact that the IAU has put its reputation behind such words, we should not support a technically and linguistically flawed planet definition: doing so would only further the damage to astronomy already done by this definition. So on this Web site and in documents, discussions and other aspects of the New Horizons mission, we will continue to refer to Pluto as the ninth planet. I think most of you will agree with that decision and cheer us on. I'll close this PI Perspective now with a very brief editorial statement on this matter: One of the aspects of science that is most exciting to me personally is its adaptability to new facts, even if they dictate paradigm shifts that dethrone comfortable old perceptions. The dawning realization that our solar system contains vast numbers of dwarf planets, which outnumber their larger cousins like the four terrestrial planets and the four giant planets, is a dramatic demonstration of just such a paradigm-shifting discovery. Some IAU astronomers are challenged by the implications of this recent realization, which portends that the Earth is more a misfit object in the solar system than is Pluto, and that dwarf planets, like dwarf stars and dwarf galaxies, are the most representative members of their astronomical genus. Some other IAU astronomers are challenged by the notion that the list of planets, like the lists of stars, states, rivers, galaxies and mountain ranges, will be too long to easily memorize. I'm not bothered by either of these concerns, but I am disappointed to find scientists afraid of changes in dogma when they are presented with new facts. Of course, some of my colleagues would say I haven't adjusted to the fact that Pluto and other dwarf worlds of the deep outer solar system orbit in a swarm, making them something else other than a planet. Well, to my mind, planets (like stars and galaxies, I note) are what they are, independent of what they orbit near. As I've said before in print, were location and context valid in biology the way that some want it to matter in planet definitions, a cowboy would become a cow when he herds his cattle. What is not controversial is that the subject of planet definition remains one of debate. Textbooks and teachers are going to have to recognize that the astronomical community is still adjusting to new facts and no final consensus is yet available. As I have said to the daughter we put in college last week many times, as you grow up, you realize more and more that life isn't all black and white, but endless shades of gray; it's complicated, and there's no getting around the fact that you just have to get over the untidiness of the real world and move on. I believe that planetary science is just now grappling with just such a realization that our tidier youth, before the discovery of extra-solar planets and Kuiper Belt dwarfs, never belied. If you want to read more about my own thoughts on planet definition and the dawning realization of the dominance of dwarf planets, just check out an article I wrote last year: http://www.thespacereview.com/article/450/1. That's all for now; so until next time, keep exploring!